Democratic presidential candidate Beto O'Rourke is holding three rallies across Texas on Saturday, his first campaign events in his home state since launching his 2020 bid two weeks ago. US Rep. Beto O'Rourke, D- El Paso, thanks the crowd of supporters as he leaves the stage during the Turn Out For Texas Rally with Willie & Beto held at Auditorium Shores in Austin, Texas, on Saturday, Sept. 28, 2018. U.S. Rep. Beto O'Rourke is running against Republican U.S. Sen. Ted Cruz, in a one of the top U.S. Senate races nationally this year. Beto O’Rourke is making his 2020 debut this weekend in Texas — and seizing an opportunity to shore up his home-field advantage as the state begins to draw serious attention from his rivals. After a whirlwind eight-state, 11-day trip outside Texas, O’Rourke is holding three rallies here Saturday to formally launch his White House bid. 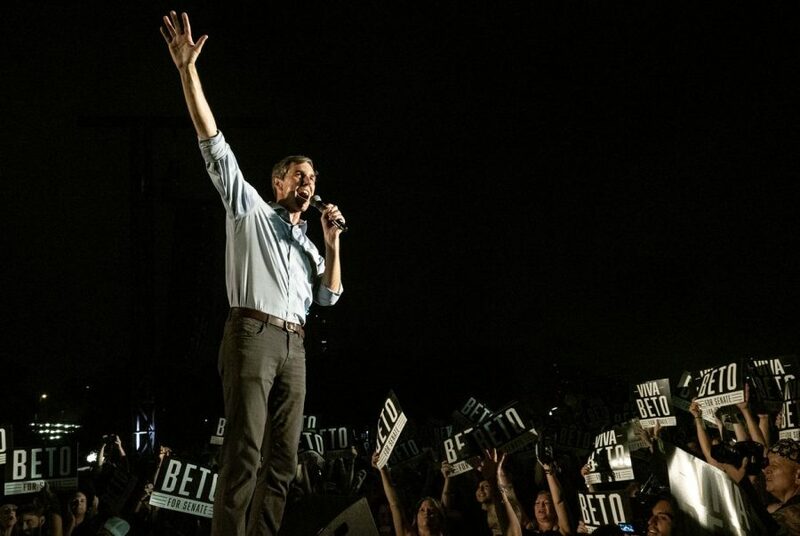 They are his first campaign events in Texas since declaring his candidacy March 14, and they are taking place in three cities where he ran up the score in the U.S. Senate election last year: his hometown of El Paso as well as Houston and Austin. O’Rourke has remained a political rock star in Texas since his closer-than-expected loss to Republican Sen. Ted Cruz in November, but the presidential race is not the Senate race. A number of his White House rivals have already come to the state looking to make inroads — and there is another Texas Democrat, Julián Castro, who has been running for over two months. “In Texas what impresses me the most about Beto is I drive around my neighborhood and there are still Beto signs up. Everybody else’s signs are down,” said Garry Mauro, the former land commissioner who chaired Hillary Clinton’s 2016 campaign in Texas. Yet Mauro still sees opportunity for other candidates in Texas, saying he thinks “there’s room for somebody to spend some time, effort and resources and build a base” in the state and potentially chip away at O’Rourke’s advantage. O’Rourke’s homecoming falls 11 months before the delegate-rich Texas primary and appears bound to leave an impression about his continued dominance in Texas politics. Thousands of people are expected to attend each rally, and each is being held in large, picturesque outdoor spaces. In Austin, the rally is taking place in the heart of downtown, with the state Capitol as a backdrop. In Houston, the rally is happening outside Texas Southern University, where 2020 rival Kamala Harris held an indoor rally last weekend. O’Rourke’s campaign is making sure to use the day to mobilize supporters in Texas and far outside it, with volunteers hosting over 1,000 watch parties in every state and territory. Closer to home, though, Democrats will be watching to see just how emphatically O’Rourke reclaims center stage after a series of earlier-than-usual drop-ins by his opponents. Several of them descended on Austin earlier this month for the South by Southwest festival, though a couple others have visited on their own — like New York U.S. Sen. Kirsten Gillibrand last month and Harris last weekend. In her trip, Harris sent perhaps the clearest message yet that non-Texas candidates do not plan to cede the state to the two native sons. On Friday, Harris became the first White House hopeful to visit increasingly competitive Tarrant County, which O’Rourke flipped in November. The next morning, she met in Houston with some of the 17 “Black Girl Magic” judges who swept into office last year in Harris County with O’Rourke atop the ticket. And then she held the rally at TSU, which drew an estimated 2,400 people — some of them waving campaign-made signs reading, “This is Harris County” — and featured an endorsement from county commissioner Rodney Ellis. Ellis, a former longtime state senator, said he has known Harris for decades — since she was fresh out of law school — and gave Castro and O’Rourke a heads-up before his endorsement. Ellis thinks she will make her Texas competitors work to win the state nomination. “And I’m certainly gonna help her,” he said. Castro has already made a bold effort to show off his home-state support, releasing a list of 30 Texas endorsements on the same morning O’Rourke announced his campaign. There were later questions about whether all the names were exclusively behind Castro, but the list nonetheless illustrated his support among some Hispanic Democrats, not just in San Antonio but also in other parts of South Texas and along the border — places where O’Rourke underperformed in the Senate primary. One of Castro’s more attention-grabbing endorsees was state Rep. Mary González, a member of the El Paso delegation to Austin and so far the only elected Democrat from O’Rourke’s backyard to side with Castro. Julián Castro, for his part, will not be in Texas on Saturday, instead campaigning in Iowa. It will be his second trip to the first-in-the-nation caucus state since he launched his campaign in mid-January. And while he works to make good on a pledge to visit all 50 states, Castro has not neglected Texas, kicking off his campaign in mid-January on San Antonio’s West Side and since holding smaller events elsewhere in the state. That is the sentiment of many Texas Democrats at this early stage in the race — not just gratitude for the two home-state hopefuls but also for the growing spotlight on Texas as a potential battleground. Dyana Limon-Mercado, who chairs the Travis County Democratic Party in Austin, said she has already heard from several non-Texas campaigns — including Harris’, which expressed an interest in visiting the county on her next trip to Texas. As for O’Rourke, Limon-Mercado praised him for prioritizing Travis County in his homecoming, noting that while he registered a massive margin there in November, the liberal stronghold is home to “very sophisticated” Democratic voters who are now exploring their options in a wide-open presidential field.